65 x 39 inches,Collection of Fred and Sherry Ross, USASigned and dated lower left"The artists and writers of the 19th Century were codifying the breakthroughs of Enlightenment thought. Liberte, Egalite, Fraternite, a deep abiding respect for human rights, and the importance of a society built on these principles and directed with the consent of the governed via a system of representative Democracy. 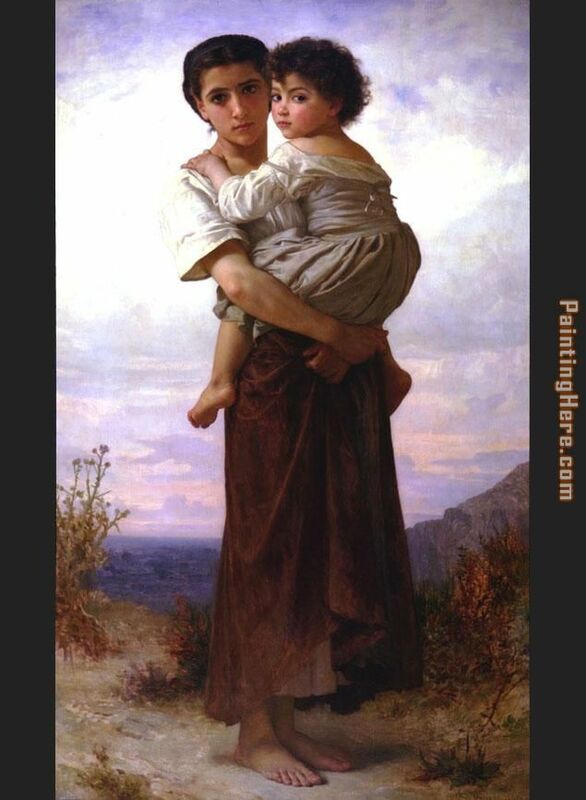 Bouguereau, the most popular artist of his day---and now of ours---drove home these ideals over and over again, in most of his 800 plus paintings, qualitatively most concentrated in the 1870's, 80's and 90's. The majority during those years were world class masterpieces.A gypsy mother, holding her young child in her arms, stands on an elevated plane silhouetted by the sky. They stand at a height that enables the viewer in the distance to see the ocean. What better way to demonstrate the equality of all humanity, than by elevating to the heavens the lowest of the low in society, its gypsies and peasants. The figures both welcoming and relaxed look down directly at the viewer: ironically in the more elevated position but clearly prepared to accept on an equal footing, the well-to-do classes most likely to be viewing them. ""Modernist ideologues love to say that Bouguereau was irrelevant to his times because he wasn't one of the impressionists who were carving out the path to abstract expressionism. Nothing could be further from the truth.Nothing could have been more relevant, than works like this that ennobled and elevated gypsies and peasants and dealt with the most poignant and important issues of the times.They are both beautiful without being overly sweet and pretty; 'real' and 'ideal' at the same time." Beautiful, original hand-painted artwork in your home. Interpreted paintings based on the masters' works of William Bouguereau.This Young Gypsies needs about 14 - 16days for production by a talented artist. If you're not happy with William Bouguereau Young Gypsies that you made on PaintingHere.com, for any reason, you can return it to us within 50 days of the order date. As soon as it arrives, we'll issue a full refund for the entire purchase price. Please note - PaintingHere.com does not reimburse the outgoing or return shipping charges unless the return is due to a defect in quality. If you want to purchase museum quality Young Gypsies at discount price, why not give us a try? You will save a lot more! This William Bouguereau Young Gypsies needs 14 -18 days for production time frame. We ship all over the world. We can provide Young Gypsies Painting stretched canvas and large framed art.